I move on today, saying goodbye to my friends last night as I get up early. 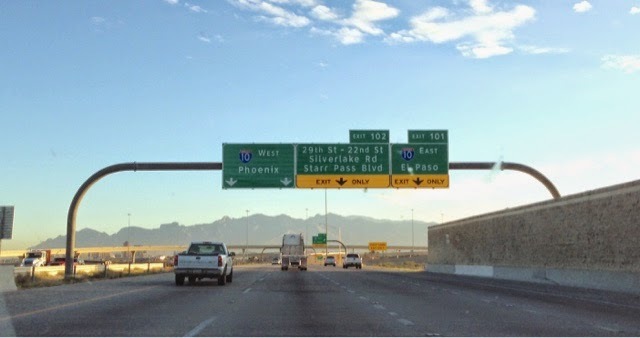 With a stop at McDonalds I'm on the road to Phoenix by 7:00 am. It's only 90 so miles away but I want to try to get some disc golf in before the ball game. 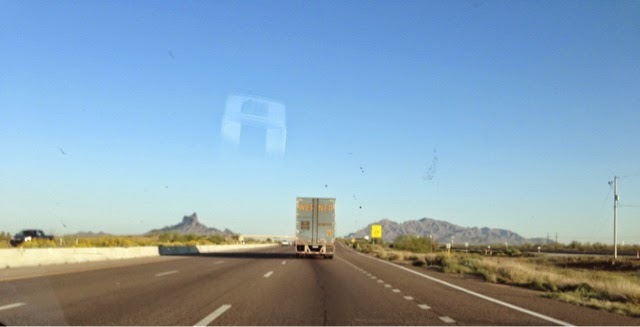 On the way I saw the sign for the Casa Grande Ruins National Monument on the highway. I hadent been there last year so I am early I will go. 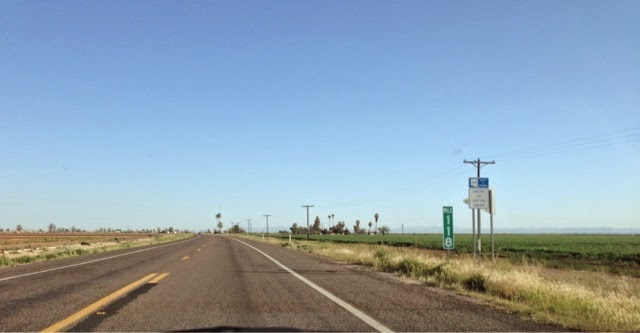 I'm driving past cotton fields on my way to the Ruins in Coolidge, AZ. 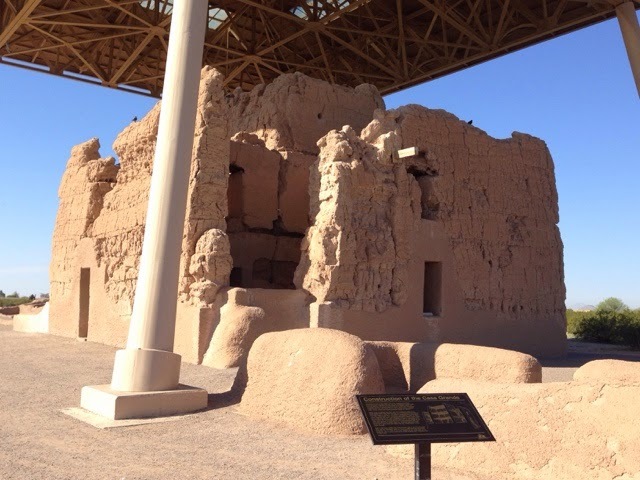 The ruins are not in the town of Casa Grande that is about 15 miles southwest. I arrive and have to wait a half hour for the park to open at 9:00 am. I'm the first one there and get a warm welcome from the volunteer Jim who had been doing this for 3 years. He is full time in the area where he says many volunteers are seasonal. They get hired by the park service and get free hookups on site and work their hours in return. 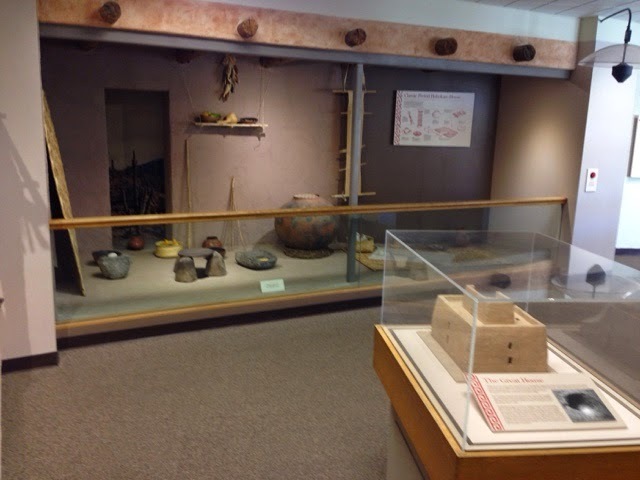 There is a very nice inside museum type gallery. They have many displays and also a theater where they show a 15 minute film. You can take a tour or you can move along at your own pace and read the panels around the site. 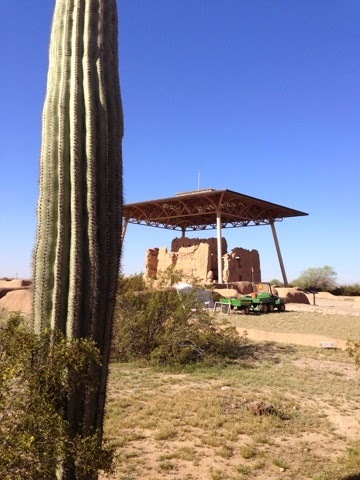 The Indians thrived here for about a thousand years and built this large building in about 1300 others call Casa Grande. It was named by the first explorer to the area in the 1600's that was a Franciscan Monk. The Indians had abandoned it around 1400 for reasons not known. They had built this elaborate society of 2000 with canals to water their crops. They dispersed and Indian tribes in the area are believed to have been descendents of them. The building was built with the ability to recognize the solstices. 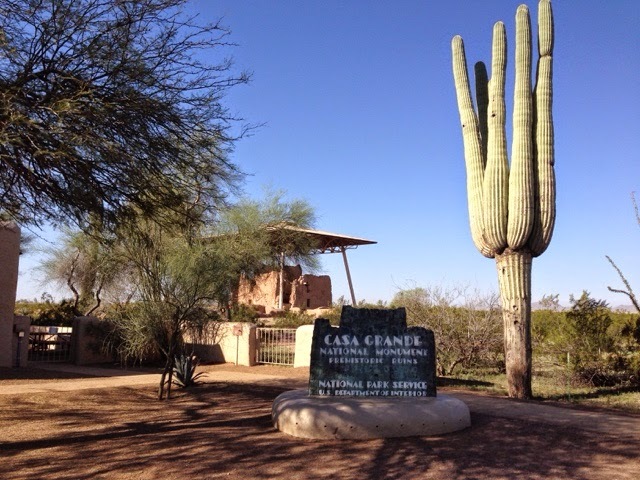 Casa Grande was the first protected monument by the U.S. When Arazona was a territory in the late 1800's. The stage coach route came by it and people were taking artifacts and distorting the building. 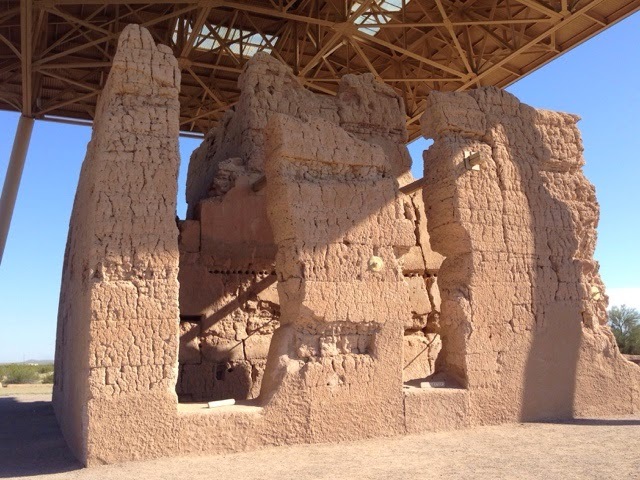 A shelter was created in 1911 to protect the decay of the ruins. It was replaced with the current day cover in 1936. 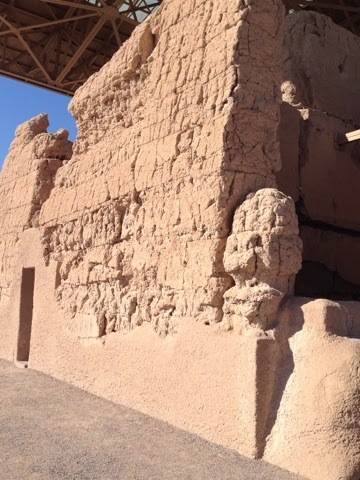 Casa Grande has 7 foot walls and its large timbers came from forests 60 miles away and they had no draft animals or horses at this time. A very nice flowers on site. 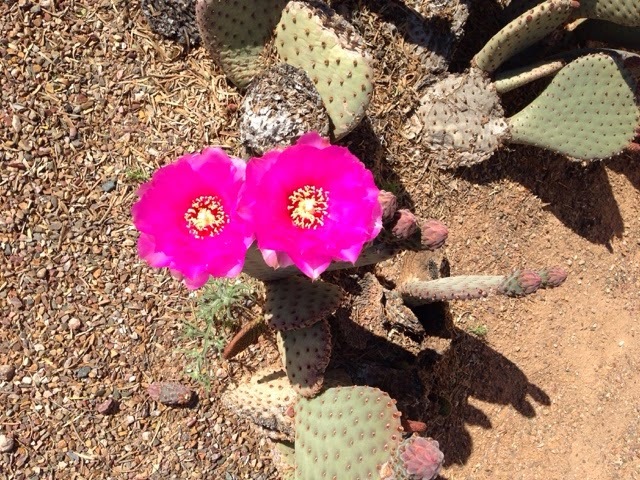 Another bloom at the top of this cactus. 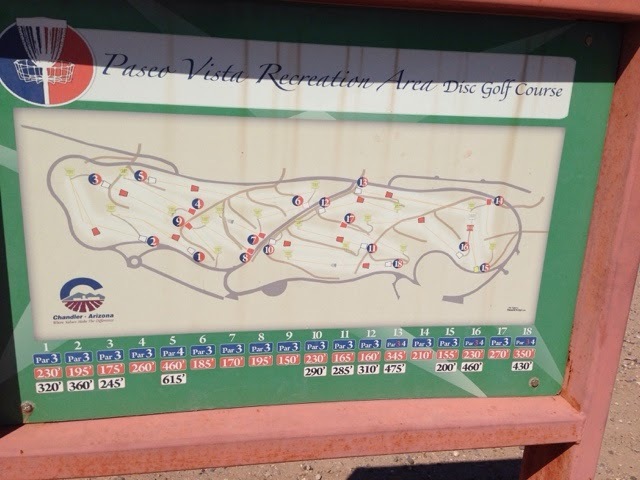 I then drove up the road to Chandler to play the disc golf course I like there. 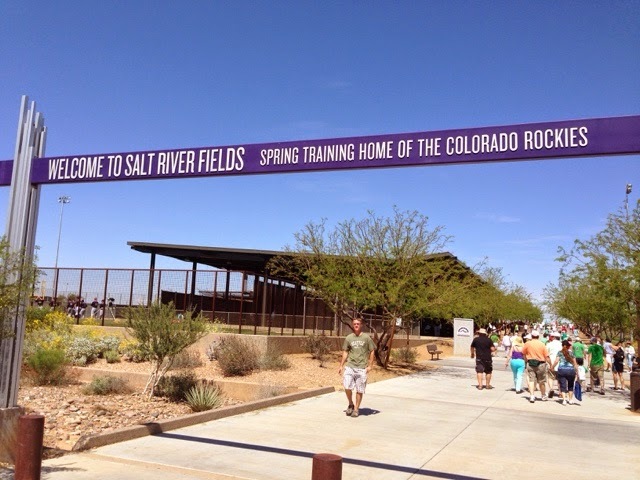 I only had time to play 8 holes before leaving for the Salt River ball field at Talking Stick. This park is better to attend than some others in the area as the access off the highway is good, they have good signs, they have people fir ting you to park. Some parks don't have dedicated parking and you need to park on street and this creates a lot of congestion. 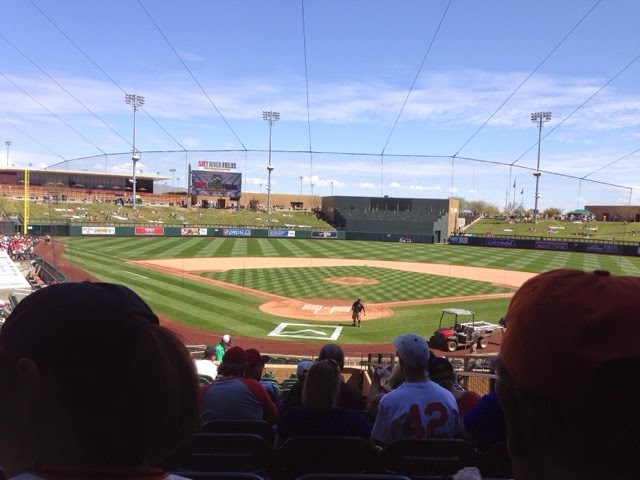 My seat was behind home plate. Very nice. They painted the bases green for St. Patrick's Day. 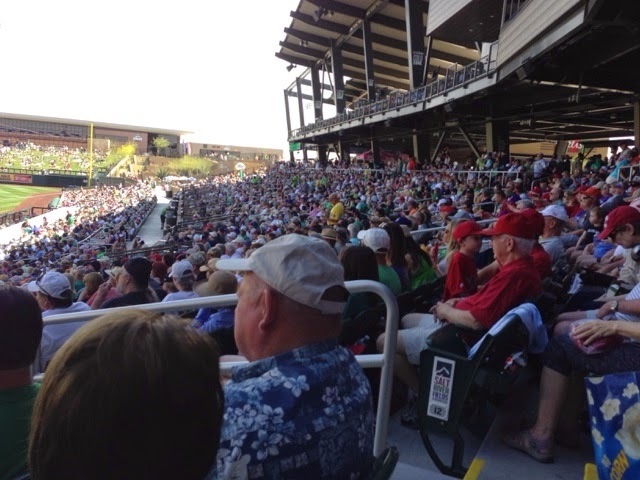 There was a very good crowd for this home game for the Colorado Rockies playing the Los Angeles Angels. 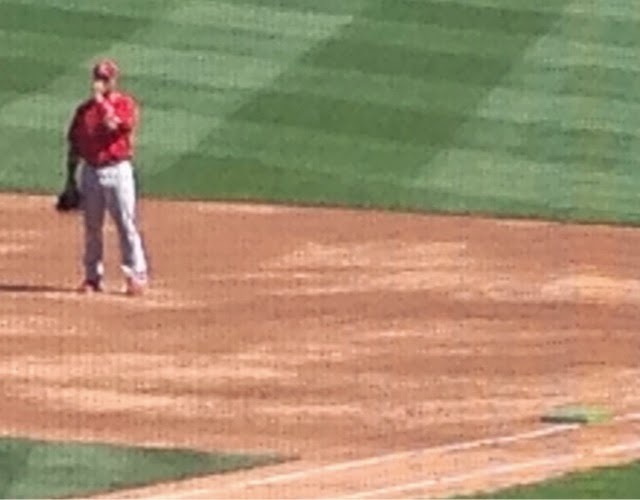 Unfortunately the game was lopsided with LAA winning 10 to 0. 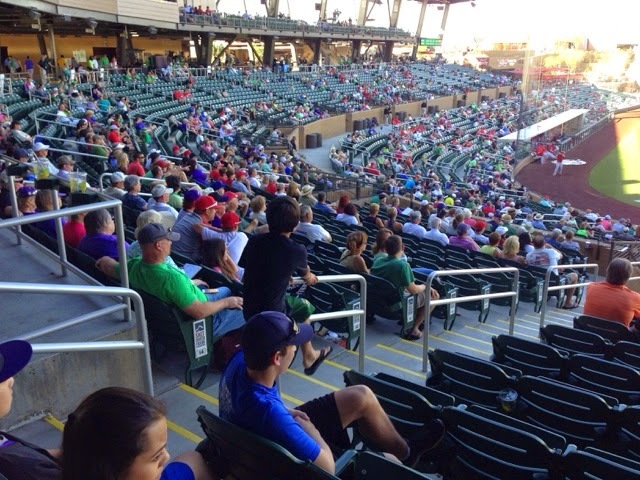 Many people had left by the 7th inning stretch. 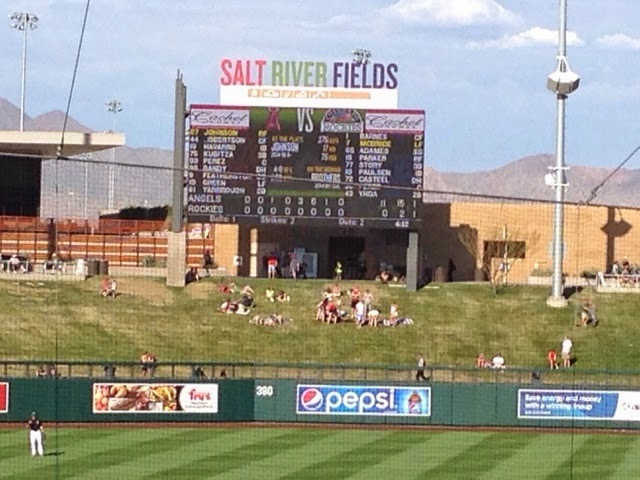 For me either way it was fun to go to the game on this nice sunny day in the 80's. 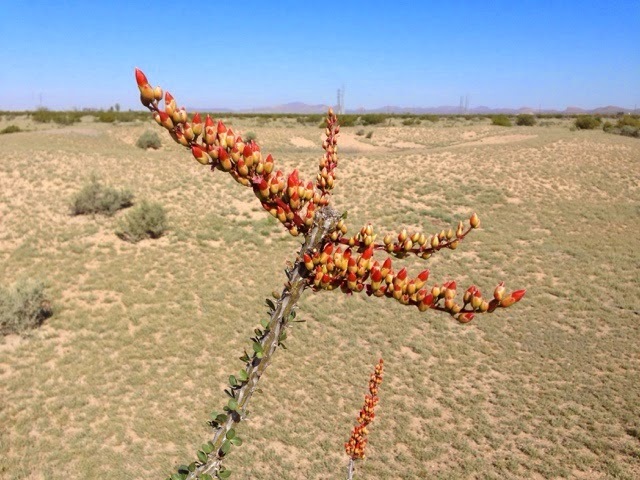 While I was sitting there I decided to drive to Quartzsite, AZ for the night as I plan meeting a childhood friend that I have not seen I this since around 1970. She lives in Havasu City, AZ. I had originally planned to stay in Phoenix for the night, but changing my mind is no problem as I am self contained in the Prius. A snagged toy plan was a traffic jam on the first highway. 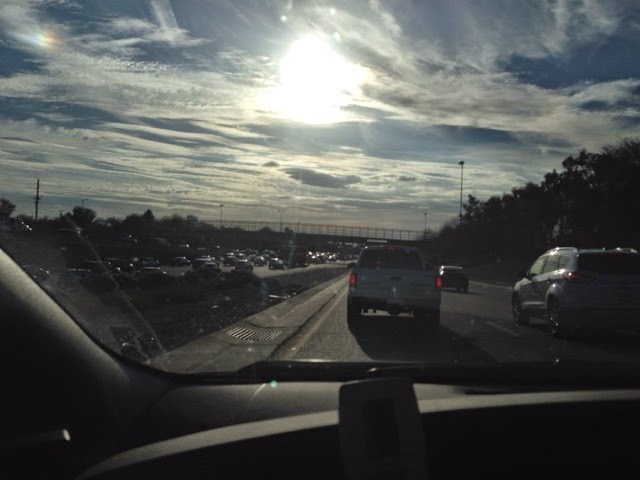 Then a longer traffic jam on the next road. I was delayed 2 hours. 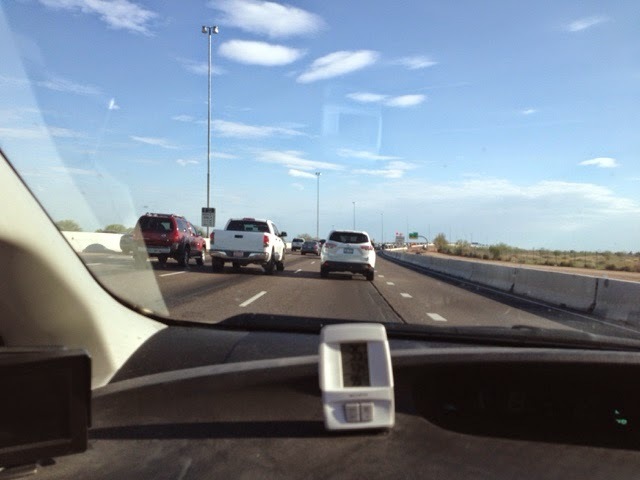 Traffic is one of the reasons I like Tucson better than the Phoenix area. The delay and the long drive got me to Quartzsite at 8:30 pm. I knew where the BLM land is near I10 so I didn't have a hard time finding it. The only problem is that it is so dark I couldn't drive around looking for a good spot so I parked near the entrance where the camp host is. I should be gone before its light in the am so they may not know I even stayed. It's free so it doesn't make a big difference but the BLM folks at this site like to keep track for the 14 day limit. In the past if I stayed only one night they didn't care. It's hotter here than Tucson. It's 9:30 and still 79 degrees. I have the car windows open and curtains covering the opening to cool the car. 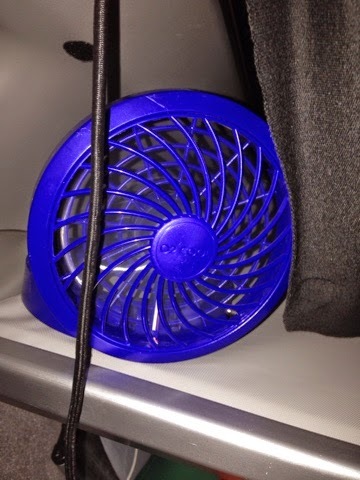 This is the first night I needed to really use my USB powered fan. It works nice and doesn't make much noise so I can sleep with it. It's compact to ad it folds flat and doesn't take up much space. It being USB peered I can power it with the car power center I made off the battery or off the house battery. 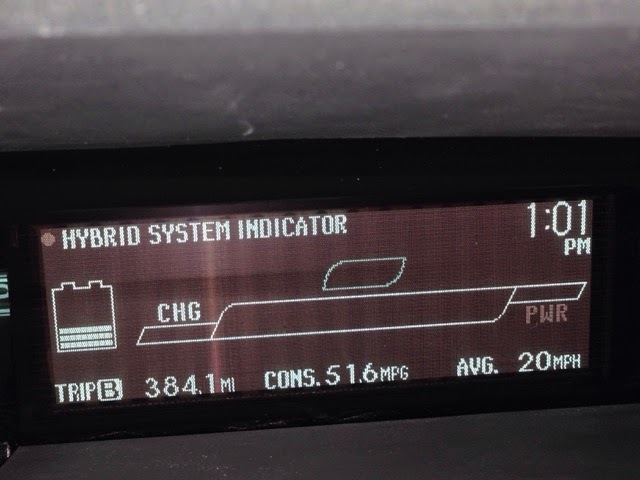 I went over 10,000 miles on my 2015 Travels yesterday. I looked at my "B" Trip odometer today and thought it was reset, oh wait. The trip odometer doesn't have enough digits to count over 10K miles so it just starts counting from 0 again. So add 10K to 384.1 and you get 10,384.1 I have traveled when I stopped tonight.